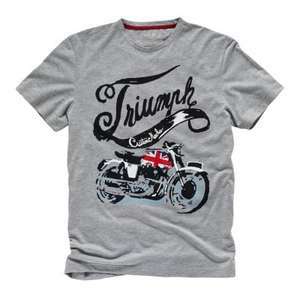 I've just come across this online shop selling Triumph motorbike paraphernalia. Men's, ladies, kids t-shirts. Plus jackets, overalls, etc. Loads available but some have limited sizes. Ladies are in 3L . Any use? Please don't tell idiots, enough trolls on here already !! My grandad would love that, he used to have a triumph. Always very limited sizes on the good deals in this Triumph Outlet..... and they're never my xl size. Been like it for many years now on these deals and not yet have i been able to buy anything. Always very limited sizes on the good deals in this Triumph Outlet..... …Always very limited sizes on the good deals in this Triumph Outlet..... and they're never my xl size.Been like it for many years now on these deals and not yet have i been able to buy anything. There is a few men's in large but they aren't £2.50. The good priced stuff never is. Just bought a few men’s size S. Hope they fit! It states delivery as £4.50 but OP has said £3.95. Is there a delivery code anywhere. It states delivery as £4.50 but OP has said £3.95. Is there a delivery c …It states delivery as £4.50 but OP has said £3.95. Is there a delivery code anywhere. Update on sizes, as I've just had my bagful delivered. Men's xs ideal for teens. Ladies 3L is more like 18/20. Very pleased with them as they are great quality tee's for all the family. And they look cool.